I have serious emotional attachment to seafood paella since I first tried it in Barcelona. I had it many times in restaurants before I finally visited a Catalan cooking school. That was double luck: the paella we made at school was even better than those really good ones I tried before. Simultaneously I figured out how to make it. The recipe performed really well both at our family kitchen and at our Moscow cooking classes for half a year and it feels like a good time to share it. Most of my time in Spain I spent in Barcelona and all my paella experience comes from there. I haven't tried another great classic paella valenciana (for which chicken or rabbit is the main protein ingredient) yet. I will do so as soon as I visit Valencia and for now I'm only talking about seafood paella, which is popular in Catalonia. Paella overall is a Spanish rice dish, which is quite unique in its cooking technology. It is different from other national rice dishes like Italian risotto, Middle Eastern pilaf, Asian fried rice etc. It is always made of short-grain rice, with very high starch content. However it doesn't cave any creaminess (apart from risotto as the rice is not stirred during the cooking. Some of the preferred rice varieties seem to be calasparra or bomba rice, but our Catalan teachers were never strict about any particular variety. The rice just needs to be short-grain (almost round shaped). In Moscow I use e.g. this rice produced by Mistral. Sushi rice is a good fit for paella, while risotto rice is not (risotto rice it is medium-grain, not short-grain). In Spain you will always see paella cooked in special paella pans. As I was told the word "paella" is actually the name of the pan, which later became the name for the dish itself. These pans are very wide and shallow. The bottom is flat and the base is not very heavy. All this permits to spread the paella quite thinly (a layer of 2-3 cm is common) and lets it cook through properly. Keep this in mind when choosing a substitute for the pan. I normally use the widest iron or cast-iron pan I have in house. If you only have heavy base pans, they are also OK, but make sure they are wide enough. A pan of 28 - 30 cm in diameter is enough to cook 6 servings. When you make it the right way, you get a delicious light brown crust at the bottom of your paella, which always leads me to inexplicable childish happiness. On top the right paella is coated with thin, but clearly visible yellow film. As the saffron stock evaporates the orange oil floating on top of it sits over the rice and forms an amazing top "crust". Saffron is an important spice for paella. It gives it both the yellow color and a subtle aroma. For me it has to be real saffron. It is sold in threads and can never cost less than several euros a gram. I normally get it on trips (from La Boqueria in Barcelona, from Turkey etc.) as I don't know where to get it in Moscow. I was told, however, that in Moscow it is sold at Dorogomilovsky market. If you are offered some cheap powdered "saffron" you can be almost sure that it is stale ground turmeric. If used in paella turmeric makes its color very aggressive yellow, unlike real saffron, which only gives a light yellow scent. Some of the touristic restaurants in Barcelona use turmeric to save on saffron and you can recognize it even by the look of their paella. Turmeric also has a complete different aroma. I do love it if we are talking about, say, Indian cooking, but it has nothing to do with paella. If I had to make paella and didn't have proper saffron, I'd perhaps prefer to make it without saffron at all then use turmeric. My preferred seafood combination for paella includes prawns, squid and mussels. Prawns can be large or medium sized. It is important to buy them raw (or frozen raw) - grey in color (not red). You will need to devein them. Peeling and removing heads is optional. Unpeeled prawns do really well in paella. Same is true with mussels. It is preferable to get them in shells. If you can't get them fresh, cooked frozen mussels in shells will do. Squid can be sliced into rings, but sometimes I really like to cut then into squares around 1.5 cm. This way the squid really mixes in and almost melts into the rice. Last important note is about stock. 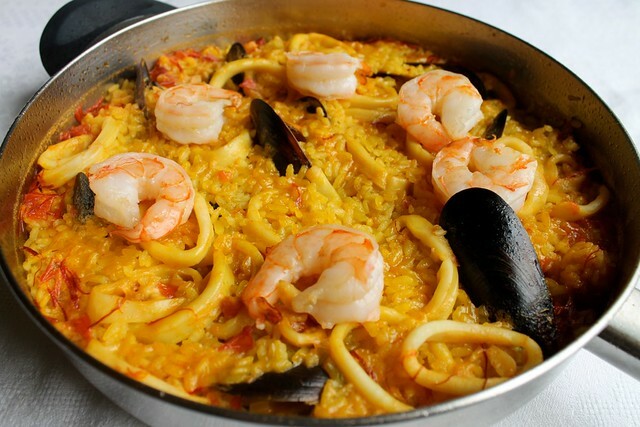 Seafood paella needs intense and flavorful fish stock. It is one of those dishes where you will easily tell the difference, if the stock was not good. The best paella I had was better than the next best paella I had because of the stock. If you can buy some really good stock ready made, please do. I don't know where to get it in Moscow, so I make it myself. It is nothing complicated and the recipe follows below. Overall making paella is not hard at all. Once you have your ingredients it won't take you much longer than 30 minutes. The process is colorful and fun. It can be a good idea for a home party, where your guests will be able to watch and / or help you while having some sangria and snacking some nice tapas. If you are cooking from frozen seafood, make sure to unfreeze it beforehand. Best way is to unfreeze is to transfer them from the freezer to the fridge the day before. However if you are short of time, just remove the packages and place all the seafood in a bowl filled with cold water. It will get ready in 30 minutes. Bring the stock to boil, mix in the saffron threads and keep it hot before using. For 6 servings pick an iron or cast-iron pan no less than 28 - 30 cm in diameter. For 1-2 or 4 servings smaller pans will do. Set the pan over medium-high heat. Add the olive oil. Once the oil is very hot, add the prawns and cook them 1-1.5 minutes a side till they are red outside and white inside. Transfer the prawns to a plate and set aside. Add the tomato to the hot oil and cook on medium-high heat stirring for 3 minutes. Add the garlic and keep cooking for around 5 minutes till the tomato gets mashed and starts browning and sticking to the pan. Add the squid and mussels to the tomato. Cook stirring for around 3 minutes, till the squid gets opaque. Add the dry rice and cook stirring for around 2 minutes till the rice gets coated with the oil. Pour in all the hot saffron stock at once. Add the salt and mix one last time. Bring to a strong boil and cook on medium-high heat without any lid for 8 minutes. Then reduce the heat to low and keep cooking for 10 minutes. It is important not to stir paella at all after you added the stock. If you do, you won't get a good result. Don't be afraid, just let it cook. If you can see it is not cooking evenly, swell the pan to help it. To check whether paella is ready take a spoon or a spatula and deep it in down to the bottom. There should be no water left and the rice should stick and brown a bit at the bottom. If there is still some water and no crust at the bottom (might happen depending on a particular pan and stove you were using), increase the heat to very high for 1-2 minutes. Be careful not to burn it though. As soon as the bottom is a little browned, remove it from heat. Layer the reserved prawns on top of the paella. Let it paella stand in the pan off the heat uncovered for 10 minutes. If you were making 1-2 servings it is a good idea to serve the paella right in the pan. If there is more, serve it on the plates, making sure everyone gets enough of the delicious top and bottom crust. Provide wedges of fresh lemon, so that everyone can squeeze out some juice over paella individually. Place all ingredients into a large saucepan and cover with cold water. Bring to a strong boil, reduce the heat and simmer, partially covered. The stock gets more and more flavor with the cooking time. To me, 3 hours of cooking is ideal. If you are short of time though, even 40 minutes will do. If needed add some water in during the cooking to keep the ingredients covered. Remove from heat and skim off any scum. If you are not using the stock immediately, it is better to let it cool down with fish and veggies in (this way it will get even more flavor). Before using, strain the stock and discard the fish and veggies. The stock can be stored airtight in the fridge for 2-3 days. For longer storage freezer is a better decision. In this case you can reduce the strained stock to 1/2 - 1/3 of its volume, by simmering it in an uncovered pan. Thus you will get a home made concentrate, which will occupy much less freezer space. Before using, you can dilute it back to its original volume. If I weren't a vegetarian AND allergic to seafood... I would totally eat this! I actually tried a great vegetarian paella at the same cooking class. You cook it the same way. In case you will be interested in trying some, just take vegetable stock (e.g. like in this recipe http://www.pinchofcinnamon.com/2012/05/very-british-pearl-barley-and-cheddar.html) instead of fish stock. Instead of seafood take some bell peppers, green peas and asparagus (optional), dice and add to the tomatoes before adding rice..